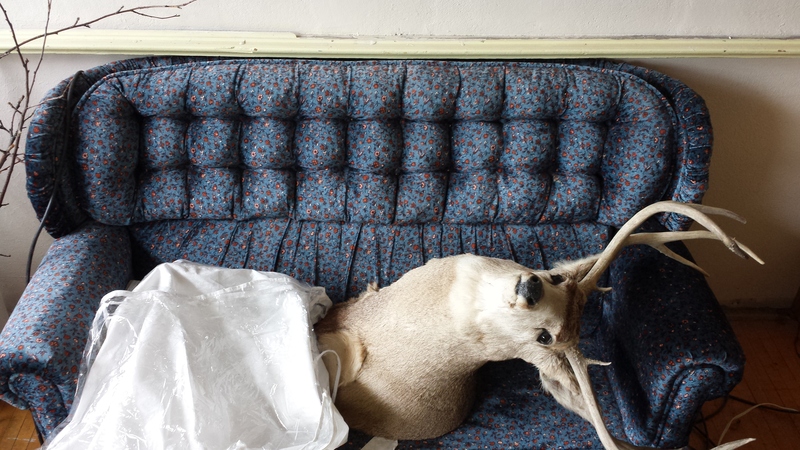 A trip to South Dakota usually involves some level of weirdness. My family is pretty eccentric. We do things differently and while it’s easy to predict that there will be weirdness happening during a visit back home, we just don’t know exactly what the weirdness will be. So, I have compiled a list of bizarre happenings during this year’s trip to South Dakota. 5. Being on a week-long Prednisone regimen as a migraine preventative during the trip. Nothing inherently strange about this, except that the major side effect was my insatiable urge to break into spontaneous song and dance in public locations, much like the Leland Palmer character in Twin Peaks. I performed ABBA’s Dancing Queen using over-sized salt shakers and crispy corn dogs as microphones in roadside restaurants, and shimmied down grocery store aisles to Prince’s Little Red Corvette, much to the mortification of my children. I’m fine now, absolutely NO urge to sing or dance now that the Prednisone is safely out of my system. 4. Speaking of Twin Peaks: this totally random and un-staged reference to the show mesmerized me in the guest room at my parents’ place. 3. Speaking of random: A visit to the Porter Sculpture Park outside of Montrose, South Dakota. The sculpture park is a remnant from my childhood. Originally, sculptures were dreamed up and assembled in St. Lawrence, South Dakota. As a small child, I would walk the two or three blocks on a loose gravel road from my grandparents’ house to the Porter workshop to stare in wonder at skeletal dragons delicately sniffing daisies and giant goldfish escaping a massive silver bowl. My favorite was always The Ballerina, a naked woman made of tiny metal tiles, kneeling on a platform, scooping up some of her loose tiles with a little broom and dustpan. There is something both wistful and majestic about her, like she is mourning her loose tiles. Seeing her on the vast South Dakota prairie was incredible. We also looked at the giant Bull Head, an amazing structure that hides some rather weird and mystical secrets inside. Bats, snakes, and demons are assembled inside the enormous structure. My husband commented as we strolled away, “Does it strike you as a bit Satanic?” The artist is an interesting fellow — friendly and all about providing tourists with an unusual experience. He accused my husband of being a Canadian when Van turned down a complimentary post tour Hershey’s Kiss, and he offered to perform a Gypsy blessing on our SUV. It was the best tourist attraction we’ve ever visited! 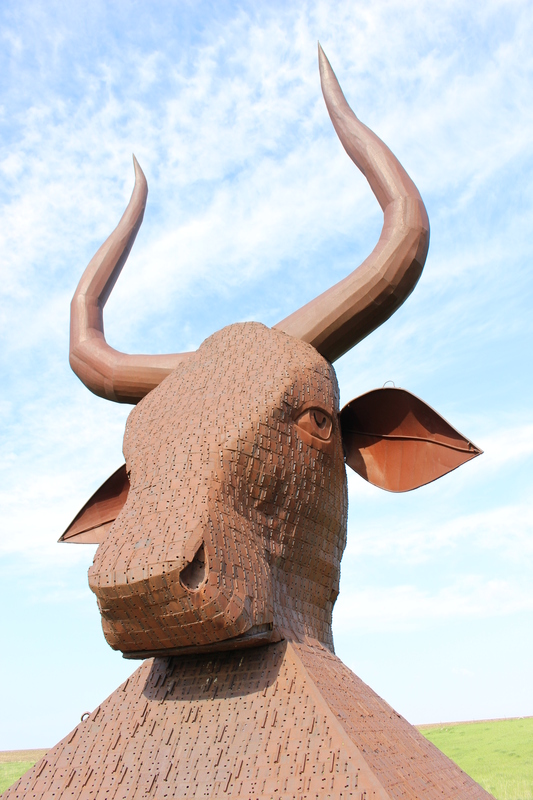 The Bull Head monument at the Porter Sculpture Park, Montrose, SD. 2. Driving across a surreal South Dakota prairie, post October 2013 Blizzard. I embraced the opportunity to spend time on some of South Dakota’s less known highways and found myself in areas devastated by last October’s blizzard, which killed tens of thousands of cattle. I was simply in awe of what the weather left behind. Instead of clear evidence of the devastation and death, there was nothing but rolling plain upon rolling plain of emerald green, yardstick tall grass, the likes of which I had never seen on the prairie in my years of living in South Dakota. The cattle that had survived looked fat and slick as they grazed next to plump antelope. Horses were up to their bellies in grasses, and they appeared to be swimming as they loped across pastures swaying like water. The killing blizzard and harsh winter with heavy, lasting snows had left an abundance of food and energy on the prairie for all that had survived, with no mention or apology for the price that had been paid for the shining beauty rolling before us. It was a strange feeling to know and understand the harshness of the land. 1. An early Father’s Day gift for Dad: a visit from the American Pickers! Okay, so it wasn’t the actual Pickers, and I have no real proof of this happening. But why would I make this up? So a producer from the show American Pickers contacted me because last year I signed my parents up for a visit (you can do that on the show’s Website). My parents are hoarders and they live in an 80 year old school = perfect material for the show. Anyway, a producer from the show contacted me and said he wanted to visit the school to see what Dad had available for the guys to *pick*. So, using my natural charm and communication skills, I did what I could to make things happen, and the crew (not the actual Pickers – sorry, I realize this is not as cool as I want it to sound) came to scope out the school and interview Dad. I wasn’t actually there at the time. I have no proof to back up my story. I have nothing to indicate that anything exciting even happened, but Dad was really happy that he got to meet a friendly T.V. producer, give a tour of the school, and possibly have a return visit from the Pickers. It made his day. And these still weren’t the weirdest things that have ever happened during a trip to South Dakota. This entry was posted in Daily Thoughts, Photography, Random Writing and tagged Montrose South Dakota, Porter Sculpture Park, South Dakota, Travel, Traveling in South Dakota, Twin Peaks on June 9, 2014 by Georgeann.